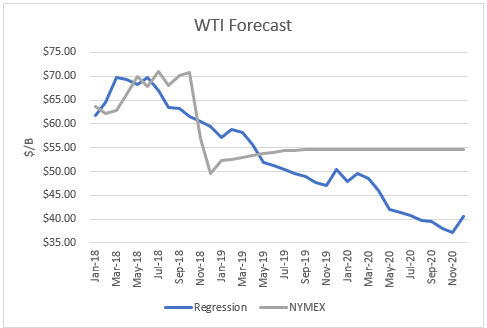 I used the model to assess WTI oil prices for the EIA forecast period through 2019 and compared the regression equation forecast to actual NYMEX futures prices as of January 16th. 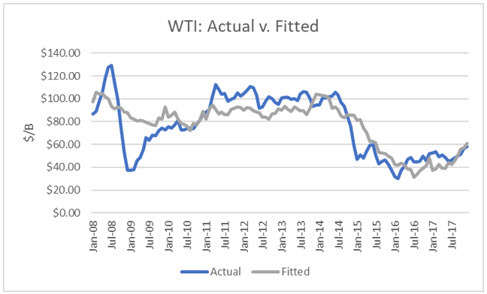 The result is that oil futures prices are presently undervalued though from May and beyond, they are overvalued. 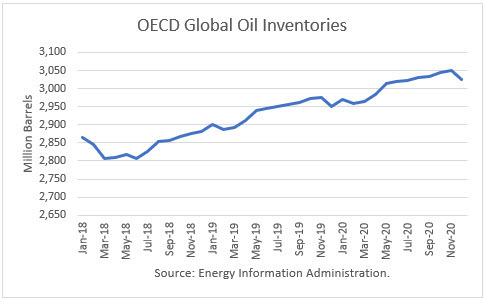 In August 2019, oil prices would drop into the low $40s if these inventories are realized. And in the latter part of 2020, oil prices would drop below $40. Based purely on this model, the oil price crash was overdone. However, the market was shocked by the sudden oversupply since it was expecting an undersupply once sanctions went into effect. U.S. oil inventories have been building fast, taking into account both crude and products. And so the price recovery following the crash is subject to another round of selling sooner or later. Two ‘surprises’ that could jolt the market in 2019 are that the OPEC+ cut of 1.2 million barrels per day is not actually occurring, and Trump may cut a deal with Iran, ending the sanctions. In the first case, there is no evidence that the Russians and other non-OPEC producers have cut anything like 400,000 b/d as promised. In the second case, Iran’s economy is suffering, and Trump would probably be happy to make a deal if Iran agrees to his terms. A deal with Iran ending the sanctions would result in the unleashing of Iran’s additional exports of more than 1 million barrels per day. I would doubt Saudi Arabia and friends would be willing to cut again to make room for Iran. Those prices will self-govern Permian activity. Look for another slowdown which would have a big effect on supplies. Those stats are of concern to me as one that wants higher oil prices. Logically it would seem to me that Saudi Arabia, Opec + Russia will have to match over supply with cuts if they are to survive economically, at least in the short term. Even 2 or 3 MBD cuts make sense if they can sell for 40% more. They still hold over 50% of world supply and currently about 46% of global production.